Lynden companies have provided support to Alaska oil and gas customers for decades. A new Lynden business, Lynden Oilfield Services, was created specifically to serve customers on the North Slope of Alaska’s Prudhoe Bay oilfields. A division of Alaska West Express, Lynden Oilfield Services provides support for oilfield exploration and production and transportation and logistics solutions to the companies working to redevelop Alaska’s existing oil and gas resources. Based in Deadhorse, Lynden Oilfield Services offers in-field logistical services for Prudhoe Bay and all other North Slope oilfields. Its new 15-acre facility includes storage for supplies like pipe and bulk materials, a cross-dock operation and a full-service maintenance shop and mechanics. “We have intermodal capability and a 90,000-pound-capacity forklift with all attachments for containers, intermodal tanks and support flats,” Hicks explains. “We also offer trans-loading and offloading capabilities including ISO tanks and containers.” Same-day field hauling and intra-field hauling of water, fuel and bulk liquids to various work sites on the North Slope will also be a focus. Mark later received a thank you from M.B. Steen, Purchasing and Logistics Manager of Furie Operating, LLC. “I want to thank you for helping us get out of Seattle a day earlier. This really helped us understand the meaning of logistics,” he wrote. 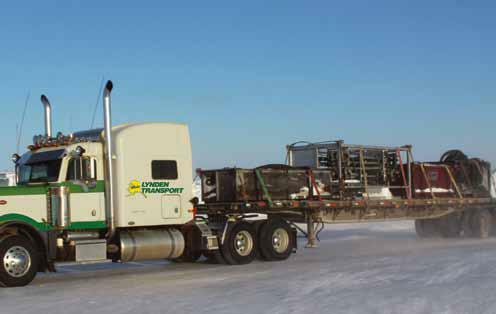 Canadian Lynden Transport and Lynden Transport handled a move from Prudhoe Bay, Alaska to Edmonton, Alberta for customer Akita Drilling this spring. 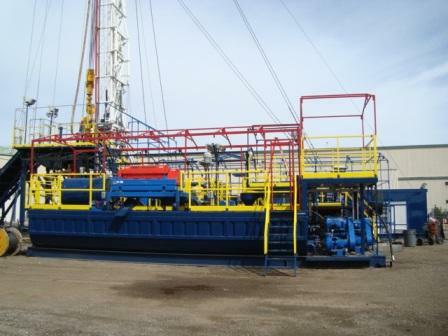 The Arctic Wolf drill rig consisted of 32 loads, including six weighing 90,000 to 110,000 pounds each. 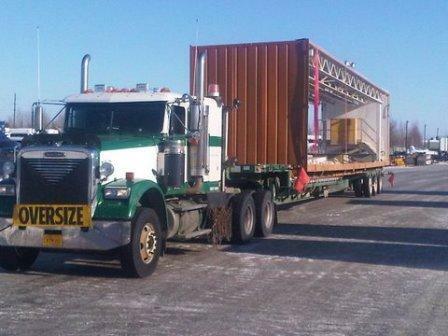 These challenging loads were coordinated by Prudhoe Bay Manager Jesse Burget and his crew and moved to Fairbanks. 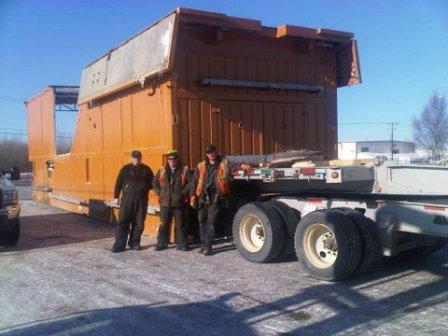 Tom Cox, Larry Johnson and Lonnie Young secured the loads in Fairbanks making them road ready for movement into Canada. Timing was important as seasonal road restrictions were about to go into effect that would delay the heaviest loads from transport to Edmonton. “The Prudhoe Bay, Fairbanks and Edmonton crews did a great job making it all happen,” says Lynden Transport Manager Mark Graves. 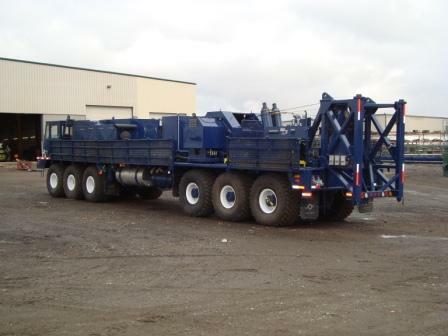 The last and heaviest load of the entire rig made it to Edmonton one day before the restrictions were in place. From left, Tom Cox, Larry Johnson and Lonnie Young with the substructure for the Arctic Wolf drill rig in Fairbanks. Lynden will have a booth at the Gas & Oil Expo and Conference in Calgary on June 7th - 9th. The conference "focuses on the latest technology surrounding conventional and unconventional gas & oil". We will be available at Booth #1229 and look forward to answering your transportation and logistics questions. See you there! Lynden Transport has supported the oil industry for years with Alaska Alcan Highway Service departing twice weekly from Houston and Dallas and return service to Texas departing from Fairbanks, AK. "The oil industry in North Dakota and Oklahoma is booming, and we made these service changes to give our customers more choices with departures and arrivals. We also would like to help customers who may want to venture into these markets and take advantage of new opportunities. We have extensive experience moving equipment, supplies and oversized freight in support of the oil industry in Texas, Alaska and Canada, so this is a logical next step for us. We anticipate North Dakota to be an extremely busy trade lane," says Sherri Brown, Regional Manager for Lynden Transport in Houston. The new routes are the latest addition to Lynden Transport's other service improvements which include a Mobile Shipping App, online GPS tracking maps, Dynamic Routing, and Predictive Delivery, a service providing customers up-to-date delivery times for their shipments in Anchorage, Fairbanks, Kenai, Juneau and Ketchikan. CH2M Hill utilizes Lynden for time-sensitive freight. This spring CH2M Hill needed a drill rig transported from Kenai to Prudhoe Bay within 48 hours. The catch: the rig consisted of 21 loads - all hot shot. The Lynden crew in Kenai quickly mobilized for the two-day rush. Customer Service Representative Danette Goode and Operations Manager Boyd Jorgensen set to work on the load-out. Service Center Manager John Jansen handled details at the Prudhoe Bay Service Center. "This was a super fast track move and, at 21 loads, quite a challenge," says Lynden Transport Account Manager Sam Amato. "We couldn't have done it without the efforts of Boyd and Danette." Boyd, in turn, recognized drivers Jason Toliver, David Martinsen and Rusty Deckard for their dedication to getting the loads on the road. "They made sure everything arrived smoothly on-site," he says. Kenai Service Center Manager Kyle Fisher summed it up, saying "Great employees and teamwork are what make Lynden so effective in situations like this. Everyone has a positive attitude and is willing to work together to make it happen for our customers." Sam was at Prudhoe Bay when the first loads arrived and later met with the CH2M Hill team that had flown in to assemble the drill rig. "They came to us with a very time-sensitive project and trusted us to get it done," he says. "In the oil business, idle equipment costs money. They were extremely happy that Lynden was able to meet the challenge." 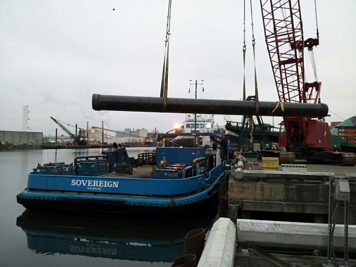 When the project was complete, Lynden moved the rig south from Prudhoe Bay to Nikiski, Alaska, for CH2M Hill. The project required 26 loads this time, instead of 21, due to road and weight restrictions. Loads went from Prudhoe to the Fairbanks yard where Lynden split them into smaller sizes for the final leg to Kenai-Nikiski. How's your work commute? Sam Amato sent in this photo looking down the haul road (Dalton Highway, connecting Livengood to Deadhorse over 414 miles). Quick, what's a mud tank? If you're not sure, let us enlighten you. A mud tank is a piece of machinery used in a drill rig. As in drilling for oil. 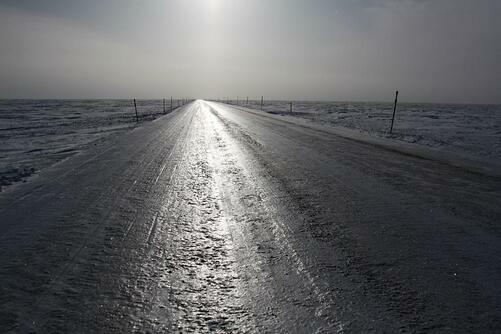 In Western Siberia. Lynden International and Canadian Lynden Transport recently teamed up on an international drill rig move for Equipment Procurement Company Limited (EPCO) out of Calgary with a final destination of Siberia. 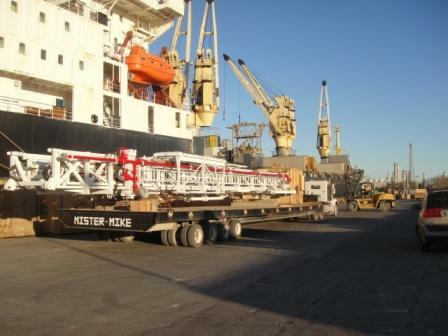 The mobile drill rig consisted of 14 pieces and four containers of parts -- the most impressive being a 93,000-pound rig carrier and mast that required special permits and an 11-axle trailer truck combo to move it over the road. The oversized loads and the proper documentation to move the freight in and out of three countries was challenging, but nothing too unusual for the Lynden team. 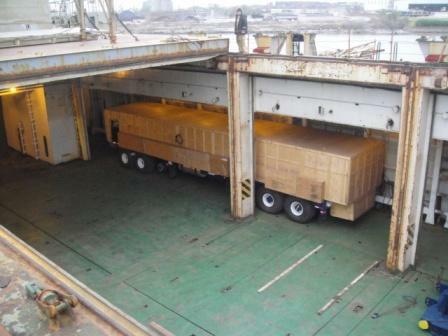 The loads went from Calgary to the Port of Houston and were then loaded aboard a ship bound for St. Petersburg, Russia. Once there, they were transferred to rail for the final leg to the oilfields in Western Siberia. 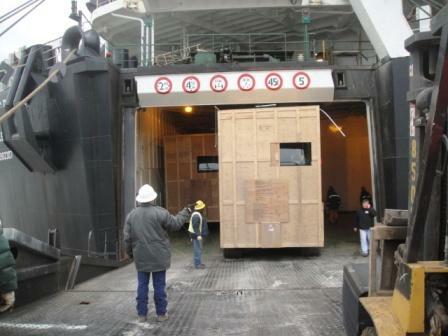 Lynden is well represented in Russia and well versed in international project shipping. Lynden International operates as AmRusTrans with offices in Moscow and Yuzhno-Sakhalinsk. From the Lynden Archives: This article was originally written in March 2010.